It’s about to start heating up in a serious way, and that means that mosquito activity is going to start heating up, as well. Starting around early April, you’re going to see mosquitoes everywhere in Arizona. Even if you don’t see them right away, you are going to feel them. They are going to be all over you, and you are going to feel like you can’t escape them. Mosquitoes love water. If you have any standing water around your house, it will attract mosquitoes and make your home the new Club Med for these annoying pests. You don’t want that. Get rid of standing water wherever it may be, and eliminate opportunities for it to accumulate. Clear out your gutters so that water can move freely down the spout instead of pooling there. Get rid of any blockages in the ditches near your home so that storm water moves out of them quickly. Fill low spots in your yard with soil, or improve drainage so that water doesn’t remain after a storm. Remove any items from your yard that might catch rainwater, such as bird baths, unused plant pots, wheelbarrows, and children’s toys. Even small amounts of standing water can attract a lot of mosquitoes, so get rid of it anywhere you may see it (or that it may collect). If you’re already xeriscaping, you don’t need to worry about this. But if you’re one of the people who still like to keep a green yard in Arizona, just make sure you keep the grass short. Mosquitoes can multiply quickly, and they like to breed in the tall grass. You can take away their love nest by just cutting the grass regularly. Plus, you’ll get in some good exercise! Spring and summer are the perfect times to do some backyard entertaining or just to spend some time outside with the family. Don’t let those gatherings be ruined by nasty mosquitoes! Hang some mosquito netting now to block off the areas where you know you’ll be entertaining. Put it around your deck, your patio, or the sitting area you have out under the trees. Be sure to place the netting around the perimeter, as well as over the top. Don’t buy just any netting for this purpose. Buy netting that is specifically designed to keep mosquitoes out. It has holes that are small enough to flummox the winged pests. Going up against mosquitoes can feel like going into battle. But you don’t need chainmail or a coat of arms. You just need to wear light-colored clothing and the right bug spray. Light-colored clothing is less attractive to some species of mosquito. You should also look for fabrics that are tightly woven since these can provide some protection against the biting bugs. Then invest in bug spray that has DEET, which is most effective against mosquitoes. You don’t have to wait until mosquitoes are on the scene to get the help of an Pexterminator. A Phoenix pest control company can provide a pre-treatment that will give you some mosquito pest control throughout the season. The treatment will eliminate eggs and provide a repellent to any mosquitoes that might wander into the area. It can have long-lasting protection that can save you a lot of trouble. Use all these tips together, and you should have a nearly mosquito-free season! You’ll be able to enjoy the warm nights with friends and family without having to worry about itchy bites haunting you for days after. 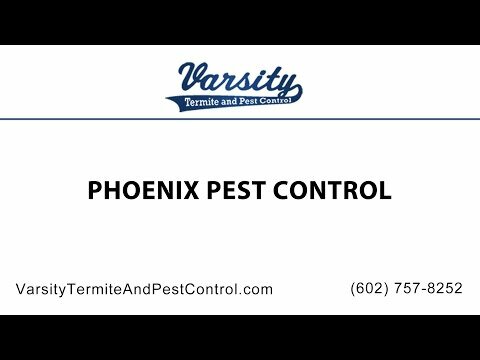 Varsity Termite and Pest Control provides mosquito pest control services in Arizona. An exterminator from our team can provide a pre-treatment that will protect your home far into the season. We offer other pest control services, as well, such as for scorpions, spiders, roaches, and other pests that can be a problem during the summer months. Call us to develop a pest control plan that will protect your home and make your summer months much more enjoyable. Read the rest of Worrying About Mosquitos During The Fall? Will Artificial Grass Protect My Home from Pests? Read the rest of Will Artificial Grass Protect My Home from Pests?